The world is a busy place and people’s time continues to become more and more of a scarce resource. This is especially true for corporate executives who are often presented with numerous opportunities that require assessing and problems that need fixing. Most times they spend a significant amount of time in meetings being inundated with mounds of information and data they must sift through to make sound decisions. So, with all that is on their plates and all the issues they have to deal with, why would or should corporate leaders care about mobile learning? Well, here are ten reasons. With mobile devices, your employees always have their learning tools/devices with them. Mobile phones are ubiquitous and pervasive in today’s society. Why not take advantage of what they have with them and are using all the time? Most times, they have paid for the device themselves and all you might have to do is help subsidize a better data plan. Concerned that everyone has a different device and is on a different platform? Fair enough, but there many ways to overcome this limitation and most are not as complicated as you might think. Mobile is global. No other technology is more accessible across the globe than mobile devices. For a company that has a distributed or multinational workforce, learning can easily be distributed using mobile technology. Even in third world countries, where running water and electricity might be scarce, mobile infrastructures are growing at an amazing rate (15 Trends That Matter – Trend #2). Performance and productivity improvements are a fact of life. As trite as it might sound, a key component to ongoing business success is doing more with less. Putting the right information in people’s hands by making that information available when they need it is an important component of mobile learning. Identify where the information gaps are for your employees, especially when they are on the then fill those gaps through mobile content delivery. Make a list of the main inefficiencies you are dealing with in your organization today and you will most likely discover that the lack of easy access to information is a leading contributor to many of those inefficiencies. The volume of information your employees need to know is increasing at an incredible rate. Take a step back for a moment and think what most people had to know 50 years ago to be effective versus what they need to know today. Whether it is more tools (Excel, PowerPoint, Word, Access, etc. ), expanding product lines with additional features or 401(k) investment options instead of company pension plans from the 60’s and 70’s, it is undeniable that most people need to remember, understand and use much more information today than ever before. Anytime you can reduce the amount of information people have to remember by making it readily available elsewhere, you will realize benefits through increased accuracy and efficiency. Mobile learning is contextual. Much of the time spent in ILT or in front of computers doing eLearning can be replaced by “learning while working.” Classrooms and eLearning must create a context for the information being taught whereas with mobile devices, learning occurs when the context presents itself. Think about the difference between trying to create a “what if” scenario for your children as opposed to taking advantage of a “teachable moment.” I think in most cases, as parents we would agree that the teachable moments are much more effective. Workplace learning is no different. 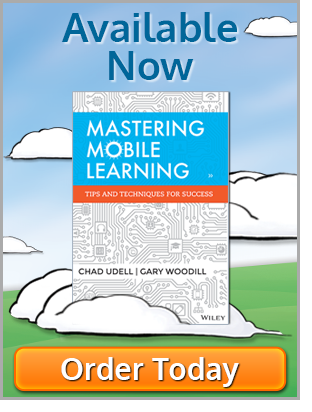 Mobile learning is cost effective. Considering the time employees spend taking part in instructor-led training or eLearning, it becomes clear that development costs are only one expense that result from these forms of learning. That doesn’t make these forms of instruction bad, but when the costs of delivering training are factored in, mobile learning can have a real advantage. In addition, the costs to develop mobile learning rarely exceed more traditional forms of learning and sometimes can be much less. In this presentation by Jeff Tillett and Mark Chrisman, they show simple, yet powerful ways to deliver relevant information without having to spend a fortune. Mobile learning is reusable – Think about how much material from a classroom training session is never used again by the people attending the training. Sure, there are often handouts or a binder full of information. But are those handouts and binders really designed for ongoing use and reference? Sometimes, the answer is yes, especially if the instructional designer has paid attention to creating solid reference materials. But the accessibility factor of mobile learning makes creating training that has a life beyond the initial use both practical and beneficial. Adaptability and speed – With properly designed mobile learning, new or updated information can reach your audience almost instantly. Imagine an SMS text message that alerts your sales force that new product information has been released. The next time they log into the mobile web or native app that contains product information, it downloads the new information and is available to the user. Where appropriate, content can be updated behind the scenes with no action required by the learner. Improved data capture – We think about training and learning in terms of a traditional teacher-student model where instructional material is prepared ahead of time and then shared or communicated to learners. But mobile devices can be an excellent way to generate content and share information gathered or learned. There are many examples of this. For instance, a camera phone can easily be used at a job site to send information about a problem to a colleague. Or, using applications like Twitter, information can quickly be shared with a group. In one instance an insurance company is looking to improve their agent recruiting efforts through the use of mobile devices. By providing recruiters an easy way to capture information about prospects and recruiting efforts, management hopes to gain valuable information about what techniques and locations are most successful and which ones need to be refined. 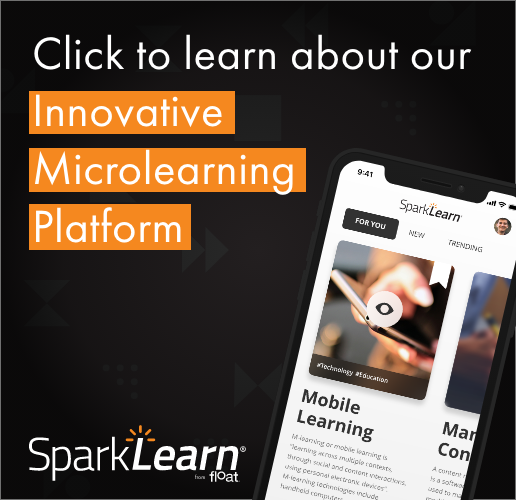 Mobile Learning is convenient – Unlike PCs that have to be turned on and booted up, or classroom training that must be scheduled, mobile learning takes advantage of devices that are virtually always on, within reach and in most cases always connected. The convenience factor allows for creating learning is more likely to be used when needed. This is not an exhaustive list but it should illustrate that mobile learning is not a fad or trend that can be easily dismissed or ignored. For executives serious about leveraging opportunities as they present themselves, mLearning deserves a closer look. If you are a corporate executive, what is your perspective on mobile learning and how does it fit into your organization’s strategy? If you are a learning professional trying to convince management to inspect mobile learning, what approach are you taking to make your point? Add your comments below and share your thoughts. A good article John, with some excellent points on why Executives should take this industry seriously. The benefits are obvious, but it’s a continual challenge of changing mind sets (particularly with L&D) around screen size, content duration etc. about how effective learning can actually be on a smaller screen. However with many companies going down a “BYO mobile” approach – http://bit.ly/frUdjg – to attract, develop and retain key staff, mobile learning offers a tremendous opportunity to engage and inform those staff on a platform that’s ideally suited to the knowledge worker of the 21st century. I think this a great article. Similar to what Martin says, the challenge is the change in mindset for instructional designers. Many still think of elearning on a small screen when we talk mobile learning. They do not realize that the shift to mobile learning changes the way we develop and present content. Most training will not be extensive elearning events on a small screen. It will move from being an event to being performance support and job aids integrated into an employee’s work.